Home / Astronomy / Astrophysics / Physics / Quantum Mechanics / Quantum Physics / Slider / What Are Fermi Bubbles? In 2010, astronomers using NASA’s Hubble Space Telescope observed giant balloon-like features emanating from the Milky Way core. The balloon-like featured are termed “Fermi Bubbles” and consist of clouds of gas towering about 30,000 light-years above and below the plane of our Milky Way Galaxy. 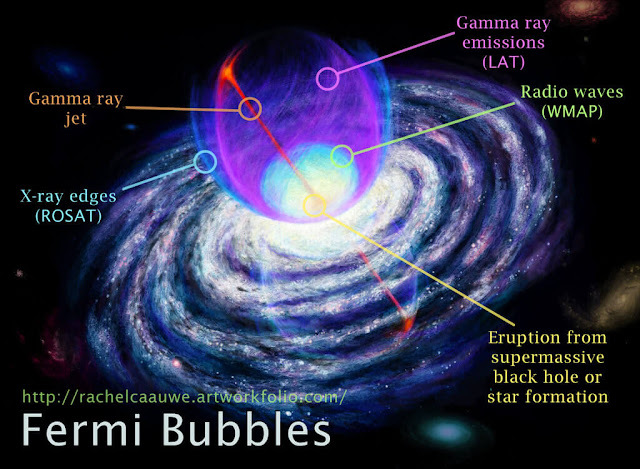 The Fermi Bubbles are made up of super-high-energy gamma-ray and X-ray emissions, which are invisible to the naked eye. 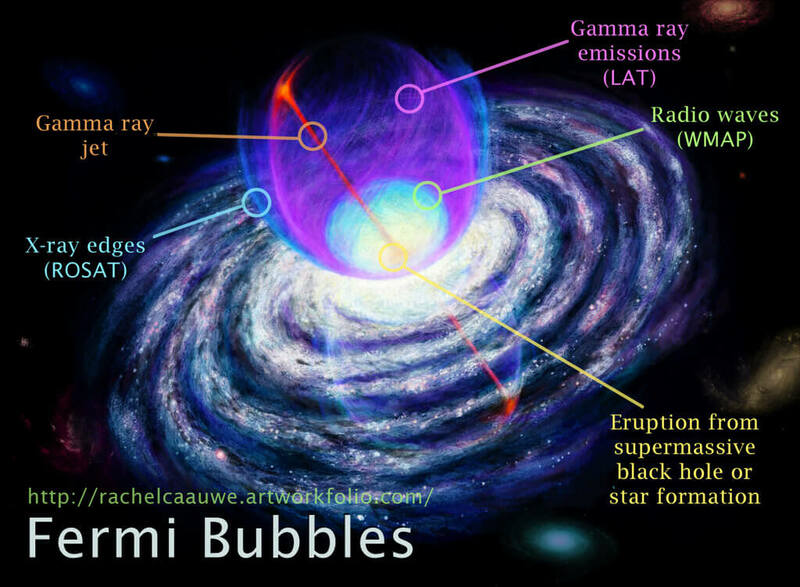 What is causing the Fermi Bubbles is a mystery. Some scientists have hypothesized that the gamma rays might be shock waves from stars being consumed by the massive black hole at the center of the galaxy. Others suggest it may be due to a firestorm of star birth at the galactic center. The gas on the near side of the bubble is moving toward Earth and the gas on the far side is traveling away. The gas is rushing from the Galactic center at roughly 3 million km per hour. The gas contains silicon, carbon, and aluminum, which indicates the gas is enriched in the heavy elements produced inside stars and represents the fossil remnants of star formation. The average temperature of the gaseous bubbles is thought to be approximately 18 million degrees Fahrenheit. The next step is to calculate the mass of the material being blown out of our galaxy, which could help determine the cause of the outburst. This could provide a vital clue to the mystery of how the Fermi Bubbles formed. Most scientists suggest a powerful event took place millions of years ago, likely when the black hole at the center of our galaxy consumed an enormous amount of gas and dust (perhaps several hundreds or even thousands of times the mass of the sun). However, this is just a hypothesis. The Fermi Bubbles currently remain a mystery.